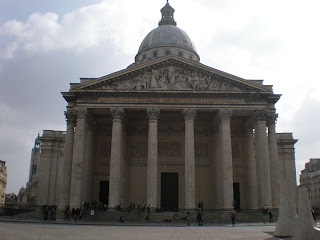 Sorry, I haven't had the time to update my blog lately because I was too busy with writing my first essay in french. I was actually signed up for an oral commentary, but since there's a strike, I had to do it in written form in stead *sigh* I actually thought our studies would finally start now, but no, Sorbonne was blocked again this afternoon. But we'll see if even the french are tired of striking after the two-week Easter-holiday coming up. At first I was horrified by the thought that I'd had to write an essay in french, but it was actually much easier than I thought. Perhaps my languages skills are getting better after all, even though I don't practise it as much as if we'd have lessons. I just sent it by e-mail to the teacher, so now I just have to wait and see what she says about it. Hope it's ok.
Rue Mouffetard. Also known from the Amelie-movie. You know, in the beginning when she hides the metallic box of Dominique Bretodeau in the telefone booth. I didn't think it looked as nice as in the movie, though :P But still worth visiting. 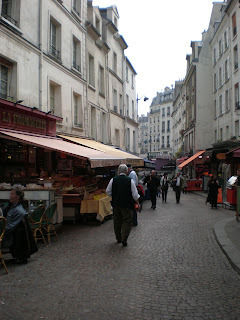 A very sweet little street whit a lot of specialized shops. 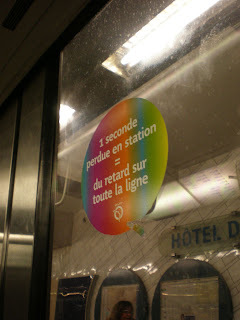 It says: "One second lost at the station = delay on the whole line"
No wonder people are stressed and depressed. You just don't feel happy when this is among the first things you see in the morning... or afternoon... or any time you take the metro somewhere! Why didn't they choose a sticker with "Don't worry, be happy" in stead? As soon as it gets a bit warmer, I will start using my yellow, smiley t-shirt to make people happier. Yes, I've bough my first yellow t-shirt ever! Amazing! I even chocked myself! Måste säga att strejkarnas uthållighet är imponerande! Jisses.